I recently found a silver Elizabethan sixpence on a farm, figured out its value, and went to see the farmer. I took along some other bits and pieces in case he was interested. While he was clearly more interested in what I was paying him for the coin, he also saw the potential. 'Would you be interested in my other farms?' he asked, which is a bit like asking if the ocean is wet. I pulled out a map, and he outlined some 2,500 acres of prime Dorset farmland in three different locations. So far, 4 hours later on just one of the sites, this is the result. 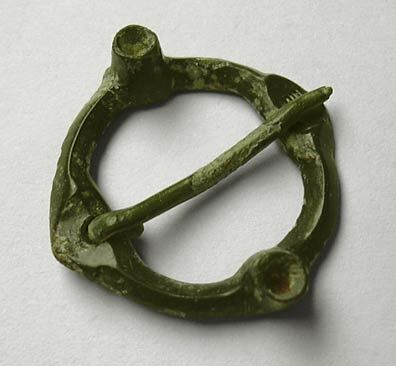 It's a bronze brooch, dating from between 1350 and 1450, and was found right opposite - quite literally just across the road - from the (scheduled, and therefore out of bounds) site of a medieval village. I have since found two Edward I pennies in the same area. 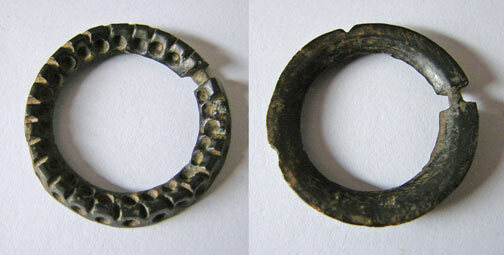 The two sockets would originally have held either polished stones, or enamel. Understandably, she now wants nothing to do with it! So, it's back in the collection. If the above brooch is a 'hers', the design of this one makes it a most definite 'his'. I thought at first it was a modern cogwheel, but the patina on the reverse clearly said 'old'. So, I kept it and gave it a careful wash. The result is a lovely addition to the collection. 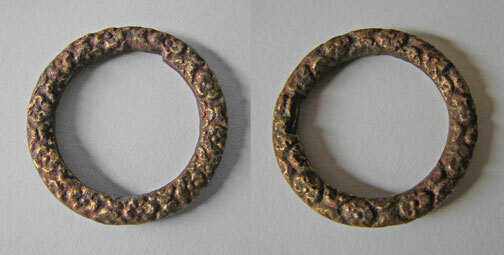 The 'v' shaped nick visible near the top of the reverse looks too smooth to have been a later accident, and is probably contemporary. The small broken spot on the left, opposite the pin hinge, may indicate the site of a missing setting, perhaps for some kind of hook .